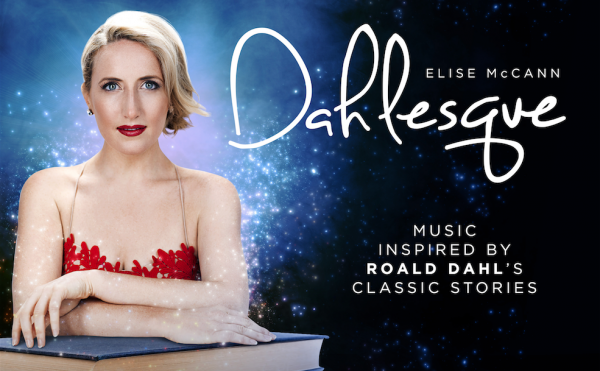 Elise recently presented the World Premiere concert DAHLESQUE at the 2017 Adelaide Cabaret Festival, following which she performed DAHLESQUE with the incredible Melbourne Symphony Orchestra in April 2018. DAHLESQUE explores the fantastical imagination and sardonic world of the irrepressible Roald Dahl, in a gloriumptiously irreverent and magical concert. Roald Dahl has captured the imagination of generations of children and adults. Perfectly combining the dual thrills of fun and fear, his penchant for the sardonic and sadistic has coaxed hundreds of millions of readers into his terrifying but alluring world. Inherently theatrical, Dahl’s books have sold more than 200 million copies, and over the decades inspired blockbuster musicals, movies, pop music, and more. Featuring music from Tim Minchin’s mega-hit Matilda, the classic Gene Wilder movie Willy Wonka and the Chocolate Factory, Pasek & Paul’s James and the Giant Peach, Marc Shaiman & Scott Wittman’s Charlie and the Chocolate Factory and more. Written by Elise McCann and Richard Carroll and Musical Arrangements by Stephen Amos, DAHLESQUE is Directed by Sheridan Harbridge and Ben Gerrard and Musically Directed by Michael Tyack, featuring an incredible 12 piece orchestra. DAHLESQUE is an evening of anarchic, outrageous, grotesque, moving, heart pounding, playful, rude and imaginative storytelling!